An intriguing novel of espionage and deceit set primarily in current-day Turkey. “Spying is waiting,” observes one of two spies waiting for the Iranian exfiltration code-named HITCHCOCK. Their wait ends when they witness a Mercedes explode with the Iranian inside. Soon, the spy named Paul Wallinger is killed when his Cessna crashes. Evidence suggests he committed suicide, but could it have been murder? In London, disgraced SIS agent Tom Kell comes in from the cold to try to learn the truth about the mysterious deaths. Do the Brits have a mole in their midst? Do the Americans at Langley care a whit about the life of a British agent? Kell ponders these questions over many cigarettes—lots of smoking goes on in this story. Wallinger’s daughter, Rachel, also wants to know the truth about the “accident,” and she places herself in harm’s way to find out. The Russians, the Americans, the Iranians and the Brits all have a stake in this “game between spies” drama. Everything to Kell becomes "a clue, a tell, a signal—or a blind alley." The plotting is solid if unexceptional—the twists and turns are unlikely to shock—and the characters are developed just deeply enough to do the job. On the other hand, the details are nicely done; for example the vivid descriptions of the Bosporus: "Kell went outside into the humid afternoon...smoking a cigarette as a rainbow arced across his shoulder towards the distant minarets of Aya Sofia." 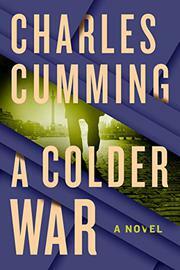 Obviously this is Cold War fare, but what the "colder war" of the title is colder than is unclear. Colder than the McCarthy era? Colder than the Cuban missile crisis? Nah. Not a bad story, but it probably won’t leave readers breathless. Spy-vs.-spy fans might give it a try.